At least 70 endangered steelhead trout were killed last Sunday when backup generators failed to restart Lake Cachuma water pumps affected by a widespread PG&E power outage across the Central Coast. The two electric pumps operated by the U.S. Bureau of Reclamation feed water into Hilton Creek — a tributary of the Santa Ynez River — when lake levels are low, as they are right now. They were activated for the first time last year when the creek was similarly dry. 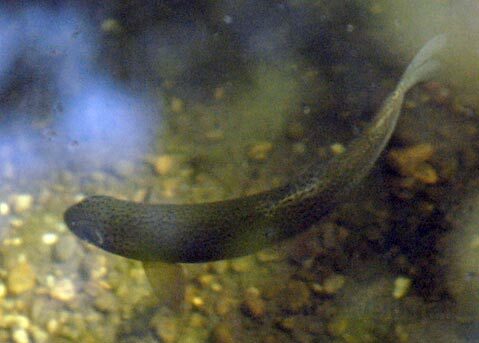 Of the 70 young fish that died, 60 were less than three inches long and 10 were between three and 12 inches. Adult steelhead reach up to 36 inches in length. One of six Pacific trout species, steelhead spend most of their lives out at sea but return to fresh water to spawn. Their offspring, called smolts, typically remain in fresh water for about a year before heading to the ocean. Steelhead were listed as an endangered species in 1997 and have been the subject of many multimillion-dollar recovery efforts throughout Southern California in recent years. Before Bradbury Dam was built across the Santa Ynez River in 1953 to create Lake Cachuma, it wasn’t unusual to see some 20,000 mature fish running up and down the river to spawn. Nowadays, according NOAA Fisheries officials, the number of observed steelhead has dropped to 0-20 adults per year. Power to the Hilton Creek pumps — and approximately 150,000 other PG&E customers — was cut at around 9:30 p.m. due to a “flash” at a Morro Bay substation. According to Lynnette Wirth with the Bureau of Reclamation, backup generators activated as expected but the pumps failed to restart. Reclamation and Cachuma Operations and Maintenance Board (COMB) staff restored water to the creek around seven hours later and notified the appropriate agencies about the incident, Wirth said. Pete Lucero, a spokesperson for the Bureau of Reclamation, said the pumps are designed to funnel 6-8 cubic feet of water into Hilton Creek every second. “When the pumps are running, they are greased, oiled, and adjusting weekly,” he said. “Otherwise, they are checked annually.” It’s not clear how long they had been on before the outage took place.